Friday, the 28th of January, 1658. RESOLVED, &c. That this Day Sevennight, being Friday, be set apart by this House, for a solemn Day of Humiliation, and Seeking of God, for his special Assistance and Blessing upon the Endeavours of this House. Resolved, &c. That Dr. Reynolds be desired to be one to assist in carrying on the Work of the Day of Humiliation, and seeking of God in Prayer, or Preaching, on this Day Sevennight: And that Mr. Gerard do give him Notice. Resolved, &c. That Mr. Manton be desired to be one to assist in carrying on the Work of the Day of Humiliation, and seeking of God in Prayer, or Preaching, on this Day Sevennight: And that Mr. Knightely do give him Notice. Resolved, &c. That Dr. Owen, be desired to be one to assist in carrying on the Work of the Day of Humiliation, in Prayer, or Preaching, on this Day Sevennight: And that Major-General Kelsey do give him Notice. Resolved, &c. That Mr. Calamy be desired to be one to assist in carrying on the Work of the Day of Humiliation, in Prayer, or Preaching, on this Day Sevennight: And that Mr. Weaver do give him Notice. Resolved, &c. That the Day of Humiliation be solemnized in this House. Resolved, &c. That the Serjeant at Arms do receive the Collection of the Charity of this House, on the Day of Humiliation, on this Day Sevennight. Sir Walter Earle, Sir Arthur Hesilrigg, Mr. Scawen, Lord Lambert, Mr. Knightley, Colonel Grosvenor, Mr. John Trevor, Mr. Swinfen, Major Beake, Mr. Serjeant Waller, Mr. Miles Fleetwood, Mr. Tho. Fitz-James, Colonel Birch, Mr. Serjeant Seys, Mr. Dunch, Mr. Foley, Mr. Edmund Hoskins, Mr. Tho. Scott, Mr. Jessopp, Mr. Weaver, Mr. Nicholls, Sir Robert Honywood, Mr. Sherwyn, Mr. Whitelocke, Sir Robert Goodwyn, Mr. Bodwrda, Colonel Clerke, Mr. Hobby, Mr. Barton, Sir Wm. Wyndham, Sir Jo. Carter, Colonel Gorge, Colonel Rich. Norton, Mr. ChaRich, Mr. Jo. Fagg, Colonel Dawkyn, Mr. Bowyer, Mr. James Ash, Major-General Bridge, Mr. Stone, Mr. Watson, Mr. Edw. Turnor, Mr. Cromwell, Sir Jo. Trevor, Mr. Attorney of the Duchy, Mr. Edm. Fowell, Major Wareing, Colonel Biscoe, Sir Coppleston Bampfield, MajorGeneral Kelsey, Mr. St. John, Sir Jo. Northcott, Sir Hen. Lea, Colonel Morley, Mr. Secretary Thurloe, Doctor Slater, Mr. Hungerford, Mr. Mitford, Sir Wilfred Lawson, Colonel Purefoy, Mr. Southby, Mr. Jo. Goodwyn, Mr. Thurland, Captain Baynes, Mr. Solicitor-General, Mr. Bennett Hoskins, Sir Tho. Barnardiston, Mr. Hampden, Mr. Whalley, Mr. Tho. Burton, Mr. Vincent, Colonel Alured, Mr. Slingsby Bethell, Mr. Gerard, Sir Horace Townesend, Mr. Whitehead, Mr. Nathaniell Bacon, Mr. Onslowe, Sir Wm. Doyley, Mr. Starkey, Mr. Trenchard, Sir Tho. Whitgreave, Mr. Serjeant Maynard, Mr. Glyn, Mr. Manley, Mr. Beck, Colonel Okey, Mr. Aldworth, Mr. Salwey, Mr. Jo. Buller, Mr. Robert Weaver, Captain Hatsell, Mr. Andrews, Mr. Mackworth, Mr. Shirley, Colonel Thompson, Mr. Hen. Fitz-James, Mr. Launce, Mr. Bunckley, Mr. Grove, Colonel Hughes, Mr. Fowell, Major-General Packer, Mr. Chute, Mr. Manby, Mr. Guibon Goddard, Mr. Greenvile, Sir Jo. Lenthall, Mr. Boscawen, Colonel Saunders, Mr. Pedley, Mr. Hewley, Mr. Waterhowse, Mr. Edw. Jennings, Sir Tho. Willis, Mr. Antho. Buller, Mr. Jo. Stapleton, Sir Tho. Beamount, Captain Griffith, Mr. Edw. Hungerford, Mr. Jo. Howe, Mr. Stewart, Mr. Ralph Delavall, Mr. Harrison, Mr. Hutchinson, Mr. Willoughby, Colonel Gibbons, Mr. Samuell Gott, Mr. Reynell, Mr. Wm. Jones, Sir Robert Pye, Colonel Freeman, Sir Theop. Jones, Mr. Reading, Mr. Buller, Sir Lislebone Long, Colonel Rogers, Lieutenant Colonel Juxon, Mr. Edmund Jones, Mr. Dalton, Mr. Barnard, Mr. Waters, Mr. Stapleton, Mr. Franc. 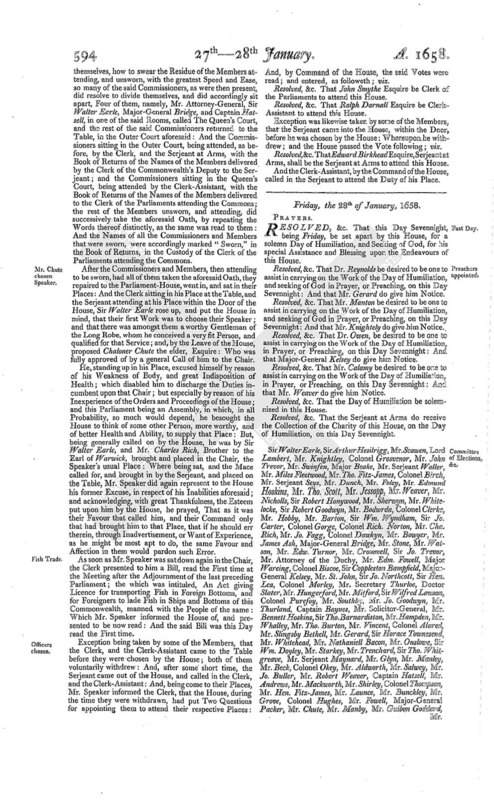 Goodericke, Mr. Attorney General, Mr. Croke, Mr. James Herbert: This Committee of Elections and Privileges is appointed to examine and consider of all Questions to grow and arise this Parliament, about Elections, Returns, or other Privileges of the House; and to report their Opinions and Proceedings therein to the House: And have Power to send for Parties, Records, and Witnesses: And to hear Counsel: And are, for this Service, to meet this Afternoon, at Two of the Clock, in the Court of Star-Chamber; and afterwards, every Tuesday, Thursday, and Saturday, during this Session of Parliament, at the same Hour and Place. Resolved, &c. That the Committee for Elections and Privileges do, in the first Place, consider of those Returns, where more than cught to be are returned for one Place; and make their Report thereof speedily to the House. Resolved, &c. That all such as will question any Elections now already returned, shall do the same by Petition, within Eight-and-twenty Days from this Day; and that those that shall question any Elections to be hereafter returned, shall likewise do the same within Eight-and-twenty Days after the Return thereof. Resolved, &c. That the Committee for Elections and Privileges do receive all Petitions concerning Questionable Elections. 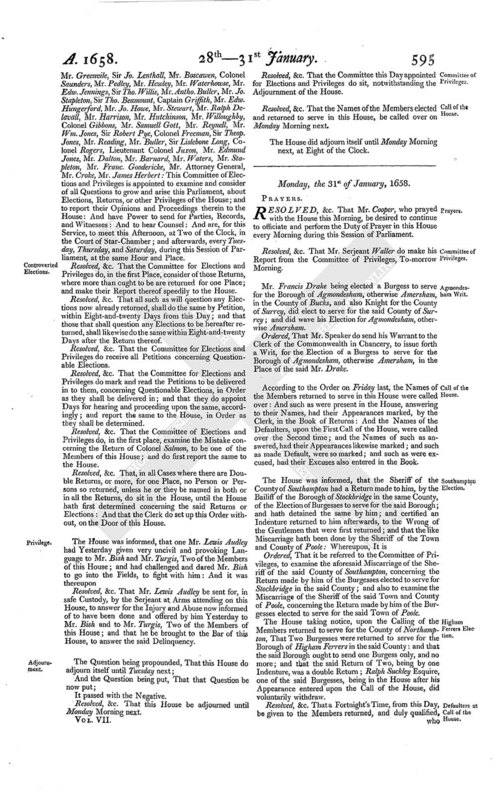 Resolved, &c. That the Committee for Elections and Privileges do mark and read the Petitions to be delivered in to them, concerning Questionable Elections, in Order as they shall be delivered in; and that they do appoint Days for hearing and proceeding upon the same, accordingly; and report the same to the House, in Order as they shall be determined. Resolved, &c. That the Committee of Elections and Privileges do, in the first place, examine the Mistake concerning the Return of Colonel Salmon, to be one of the Members of this House; and do first report the same to the House. Resolved, &c. That, in all Cases where there are Double Returns, or more, for one Place, no Person or Persons so returned, unless he or they be named in both or in all the Returns, do sit in the House, until the House hath first determined concerning the said Returns or Elections: And that the Clerk do set up this Order without, on the Door of this House. Resolved, &c. That Mr. Lewis Audley be sent for, in safe Custody, by the Serjeant at Arms attending on this House, to answer for the Injury and Abuse now informed of to have been done and offered by him Yesterday to Mr. Bish and to Mr. Turgis, Two of the Members of this House; and that he be brought to the Bar of this House, to answer the said Delinquency. Resolved, &c. That this House be adjourned until Monday Morning next. Resolved, &c. That the Committee this Day appointed for Elections and Privileges do sit, notwithstanding the Adjournment of the House. Resolved, &c. That the Names of the Members elected and returned to serve in this House, be called over on Monday Morning next. The House did adjourn itself until Monday Morning next, at Eight of the Clock.